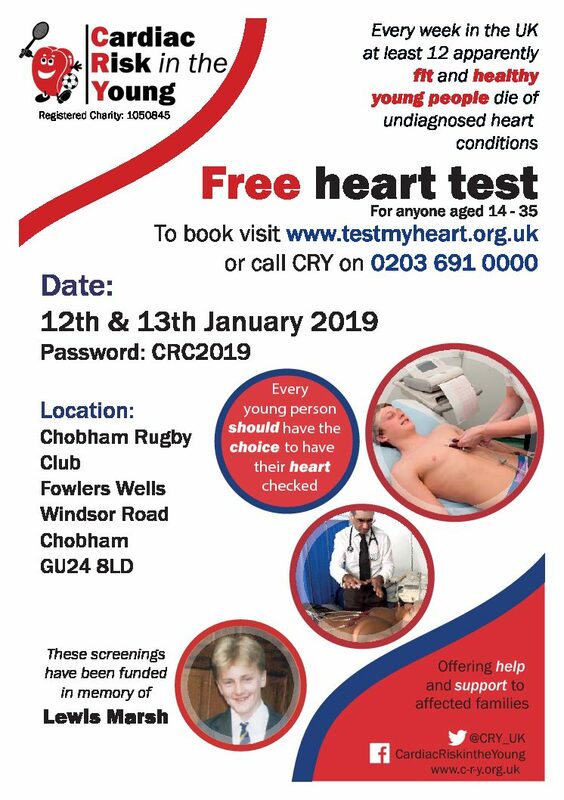 On 12th and 13th January 2019 the club will be hosting a weekend of cardiac assessment for 14-35 year olds by the charity Cardiac Risk in the Young. This has been organised by one of our members whose family have first hand knowledge of losing a young person due to an undiagnosed heart defect. Simon has raised the £10,000 necessary for Cardiac Risk in the Young to bring 4 specialist doctors to Chobham RFC and provide 200 assessments over the 2 days. The assessments will be open to anyone between the ages of 14 and 35 (members and non-members) and take about 15m. The club will be open its doors for non members to be screened, however, Chobham RFC members will have priority to book their time slots until the end of November and will be on a first come first served basis.